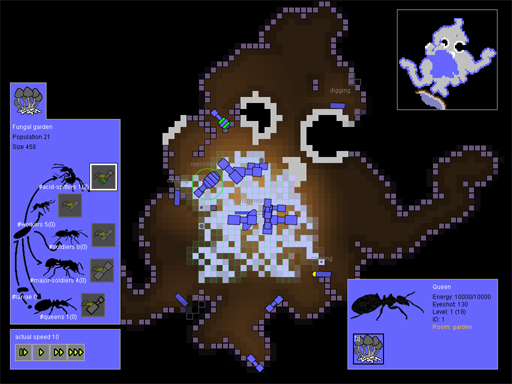 Garden of Ants (GoA) is platform independent real-time strategy game inspired by the diversity of ant life strategies. The ants represent agile predators. Some of them are capable of harvesting organic matter and transforming it, with a help of symbiotic fungi, into nutrients necessary for the expansion and the development or utilize additional resources such as sugary secretion produced by aphids. We propose that the knowledge on the diversity of life forms and life strategies available through scientific research is a powerful resource of novel ideas for game development and their implementation represents under-utilized mean of popularization of biological sciences. Establish fungal garden - use the ant queen to inoculate fungus. Expand your colony by digging the soil and feeding the fungus with harvested grains. Transform more larvae to workers, soldiers, super-soldiers, acid-spitters, thieves and queens. Defeat other colonies in your neighborhoods (kill all enemy queens).